Stir together the cookie crumbs and the softened cream cheese until well blended. Form into small balls. Cool them in the refrigerator for 15-30 minutes. Dip into melted vanilla almond bark. Sprinkle with reserved cookie crumbs. This entry was written by ~~Rhonda, posted on December 16, 2007 at 9:56 pm, filed under candy, Christmas, Recipes and tagged candy, Christmas, open house, oreo truffles, recipe. Bookmark the permalink. Follow any comments here with the RSS feed for this post. Post a comment or leave a trackback: Trackback URL. Aunt Rhonda I will attest to these being the best ever! Genny made them for us and Andrew and I just devoured them up. OK! I have got to make some of these! I think I am going to try them with some of the mint oreos too! Can these be frozen or stored for how long? Thank You for the fast response on storage, but like you said, they DO NOT last long. Thanks for sharing the recipe. 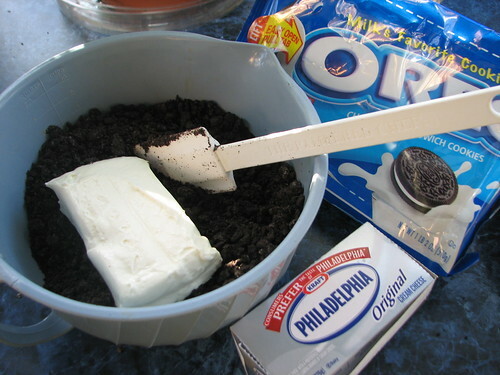 this is a must try for me, my kids love orea and cream cheese i just wanted to know how mnay balls can i make with one packge of cookie and creame cheese?? I made these a couple years ago for a party,wow they are really good!I may have to make them again this year! i dont have almond bark. is there anything else i could do or use? Jenna, any candy coating would work. Pink, purple, or pale green would be pretty for Easter. 🙂 Or use melted chocolate chips. Here’s a link about using chocolate chips. how long do refrigerate after you have dipped the balls in the chocolate? 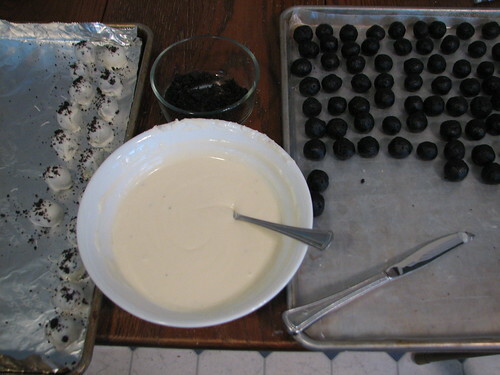 Chelsea, after they are dipped, I let the coating set at room temperature until hardened. 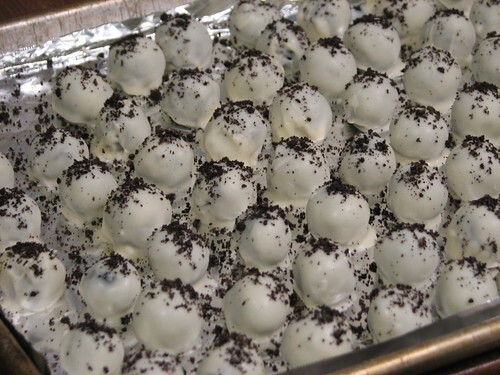 After the coating is set, the truffles are stored in the refrigerator until time to serve.